When doing anything, it’s always a good idea to have reasonable a way to undo it. Sometimes reverting something, while possible, requires too much effort or costs too much. On rare occasions, it may be impossible and one is faced with a “point of no return”. If dealing with digital data, the standard process is to restore from a recent backup. My first introduction to computers and writable storage involved 5.25″ floppy disks and cassette tapes. The saved data consisted of typed documents, which often ended up being printed. Worst case if the electronic copy disappeared, I could re-type the documents from the printed version. And of course if I lost the printed version, another could be easily generated from the digital file. By the time I started writing software, the source code resided on a hard drive inside the computer I was sitting at; the stuff I really cared about would also get copied to a 3.5″ floppy disk and then it would be set as read-only. There was no geographic redundancy, those disks resided a few feet at most, from the computer. There was also no water/fireproof safe; but if the hard drive failed or I fat fingered a command, it might take some time and I might have lost some work, but I could recover something. As time passed, I began to use source control, CDs, DVDs, network attached storage, scheduled offsite backups etc. to minimize the amount of lost work. Storage is not infinite, or at least not free, so backups often get deleted after some time, thereby somewhat limiting the window in which one can successfully restore from a given state. As I began writing the type of software that got deployed to and run on other machines, “undo” became more difficult. The standard process was to rollback to the previous version i.e. a backup, but that only covered the software, not the data that might have been generated, mutated, corrupted etc. Sometimes restoring data from a backup was an option, but more often some sort of cleanup or back-fill needed to take place, or worse additional defensive code had to be deployed to handle cases should corrupted data be loaded and processed. On some occasions, the least traumatic option might be to roll forward i.e. live with the problem a bit longer and just deploy an update with a fix. Still, as tedious and onerous as building, maintaining and executing these processes might be, they’re all in the digital realm, at least one layer of abstraction away from the physical “real world”. I hadn’t given much thought to how and when things get rolled back or forward in the “real world”. If a stop sign is installed improperly, one could rollback but it’s probably easiest to roll-forward. If a high rise apartment building starts to sink and tilt after people have moved in, it’s not realistic to rollback or obvious how to roll-forward. 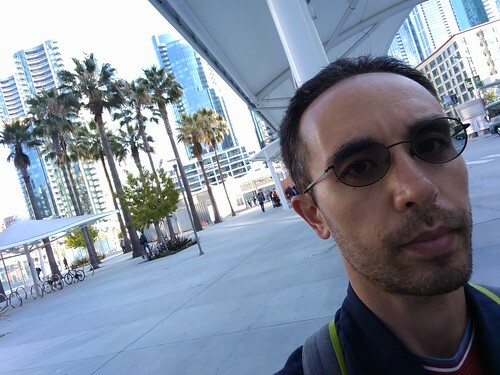 For the majority of work days during the last twelve years, I’ve taken a public Alameda County Transbay Bus from the East Bay to San Francisco. 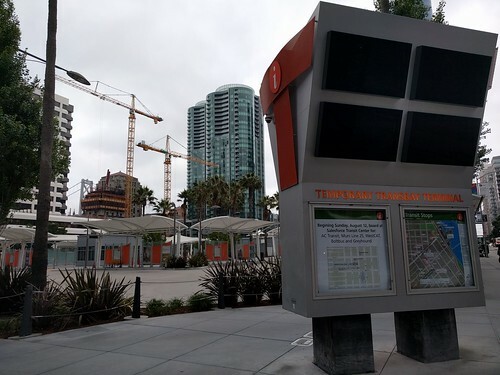 For the first four years the ride ended at the Transbay Terminal. 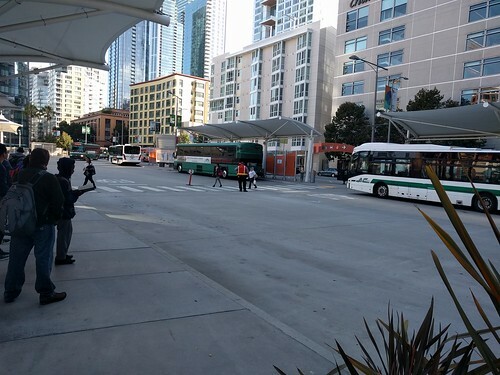 For the last eight years the destination has been a Temporary Transbay Terminal. A little over a month ago, it became the Salesforce Transit Center. My walk to work took me past the temporary terminal and one morning I decided to take a few photos as the plan was to tear it down and build housing and a park in its place, and I had no reason to believe it would ever be used as a terminal again. I even “jaywalked” across it a few times since it was safe; while it was in use the supervisors would loudly chastise (rightly so) anyone who stepped out of the crosswalk since it was not only dangerous for the pedestrian, but it slowed down the flow of the buses. However, within a week a chain link fence had gone up around the whole block, can’t have nice things. 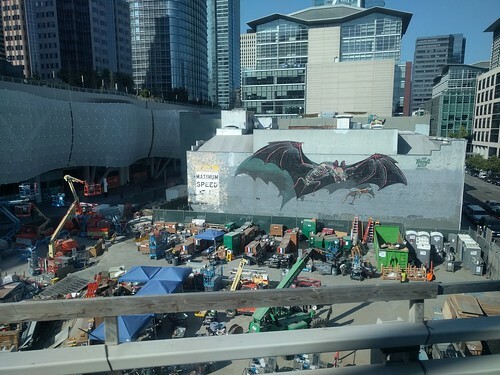 My rides home from the new transit center offered a nice viewpoint of an interesting mural and what appears to be some sort of staging area for the construction. But then only a month after opening, they discovered a crack in a steel beam. I remember walking by a worker on a ladder the previous day who was working on the ceiling with a circular saw. The scene caught my eye due to the numerous sparks flying everywhere. Perhaps it was that worker who discovered the crack while continuing his work the next day. 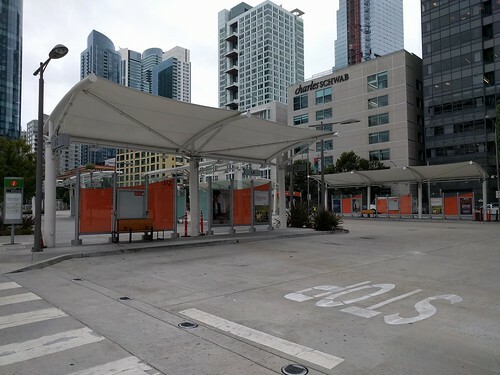 All of a sudden, portions of the chain link fence were removed and the Temporary Transbay Terminal was in use again, quite a size-able rollback in the “real world”.